7:00PM – We (my ladyfriend and I) arrive at Bally’s, with a bus ride that was the exact opposite of the trip from Chapter 17. The bus was brand new, the seats were comfortable, the smell was unnoticeable, and the traffic was fantastic. Departing around 4:30PM, we made good time on a Saturday afternoon, arriving in just under 2.5 hours. Upon arriving at the Bally’s terminal, we were greeted by a man named Kirby, who worked for Bally’s, distributing the bus vouchers. Mr. Kirby wasn’t taking any guff from the ornery bus passengers, scolding them like children each time they tried to hurry them for their bus vouchers or try to cut the line. In the line for the bus voucher, a poker player with a Seven Stars card was regaling us with tall tales, such as 16-hour poker sessions, winning $6,000 last time he was here, and staying for 5 consecutive days on comped rooms. Upon swiping his Seven Stars card and receiving his bus voucher, Kirby gives him the stink-eye. “What’s wrong, my man Kirby?” I ask. Kirby just responds, curtly, “That wasn’t his players card.” Oh, Atlantic City, never change. Finally, we check in, and head to our room on the 25th floor. On our floor, a boisterous drunk gentlemen greets us, bellowing, “WELCOME TO THE FLOOR!” We respond in kind, of course. So, for those of you keeping count, we’ve already met three strange characters on this trip, and we haven’t even entered our hotel room yet. In terms of entertainment value, I’m already playing with house money this weekend. 8:00 – We went to have dinner at Harry’s Oyster Bar, which was a huge hit with my ladyfriend. I stuck with the lobster, while she got a half-portion of the raw bar sampler. But, more importantly, Harry’s Oyster Bar is one of the few places that serve beer from the Cape May Brewery. We discovered it during a trip down to Cape May earlier in the summer, and have been itching for it since. Unfortunately, the brewery is still in its early stages, and hasn’t migrated much north of AC yet. But it was definitely a great compliment to the wonderful seafood. Other notes on Harry’s Oyster Bar: first, looking around, you could tell it was the dog days of the sports calendar. With tons of flatscreens, Harry’s would be a great place to catch a game. Unfortunately, the only things on were a meaningless baseball game, a practice for USA basketball, and some guy giving a speech for the Football Hall of Fame. If that doesn’t epitomize early August sports, I don’t know what else does. 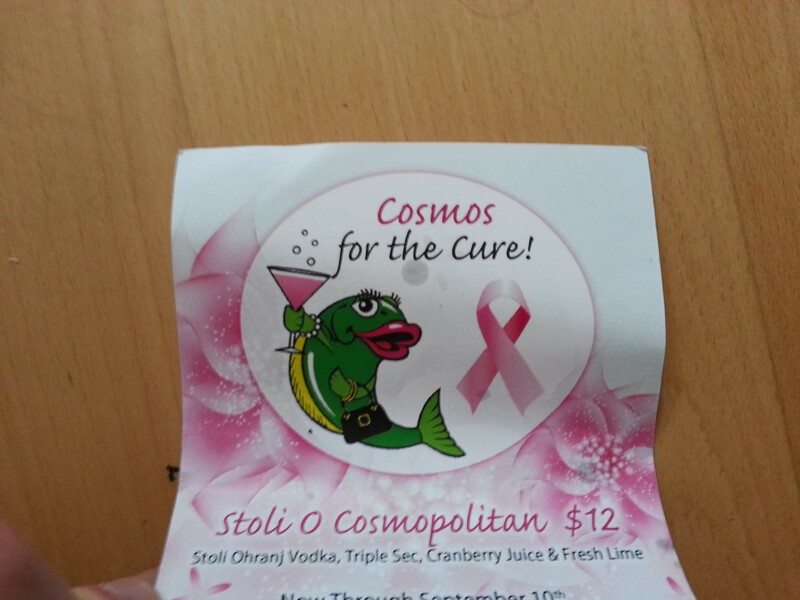 Secondly, Harry’s was promoting a deal where you would buy cosmopolitans and some of the proceeds would go to breast cancer charities. It is a noble effort, but what sells it is the “lady fish” logo. It looks like the Mrs. Pac-Man of the original Harry’s logo. 9:00 – After dinner, the ladyfriend needed a nap (after a long Friday night), so I decided to walk the boardwalk. 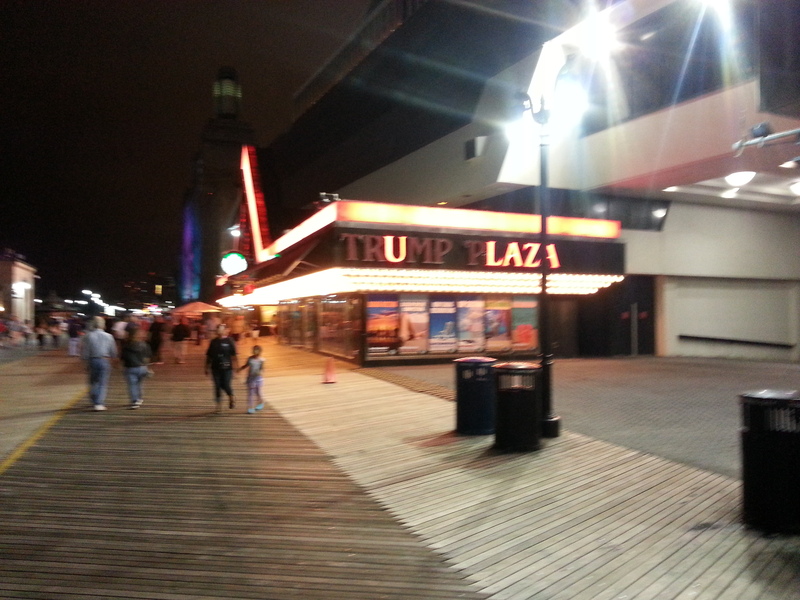 It was a beautiful night, and I love taking in the bustling atmosphere that is a Saturday on the Atlantic City Boardwalk. I stopped in to the Trump Plaza to pay my respects to the establishment in the most suiting way possible: I used the bathroom, and immediately left. My main reason for going was to visit the Playcade arcade. I am currently toying with the idea of starting a blog dedicated to reviewing old arcades, and I figured I’d give this place a test run. I’m not quite in the mood to break down the Playcade after this trip, but it’s quite tiny and could use more variety. It was mainly one wall dedicated to skee-ball, then littered with various games that are a bit too quick to play for my liking, such as coin-push games, slot machines, and crane games. There were four basketball shooting games by my count, which seems like a bit much for just one arcade. I played some Mrs. Pac-Man, drunkenly thinking I could set the new high score, and failing miserably. After goofing around in there for about 30 minutes, I took my odd collection of coins and tickets and earned myself a whopping 725 points. Normally, I like to buy a bunch of little random crap, but the girl behind the counter had taken a liking to me (I wasn’t particularly charming – this may have simply been a case of being the only guy to come into a place normally frequented by small children and mothers). She was offering me the “big prizes”, such as handcuffs or slime. Thinking handcuffs would be a bit risque, I settled for the slime. Unfortunately, the slime was 800 points, but I just batted my beautiful eyelashes and ended up with grade-A slime from China. Totally worth it. We went to the Wild Wild West, and I ran away from the group to go to the bathroom, convinced that I was still profusely bleeding from my face. Allegedly. There was a cover band at the Wild Wild West, and I serenaded the ladyfriend and Lady OB with my tear-jerking rendition of “I Want It That Way.” Allegedly. I played table games at the Wild Wild West (a welcome return to form, WWW! ), and was doing fine, but for some reason left to play games at Bally’s. I then lost $90. Alleged–crap, I did lose $90! 2:00AM – I’m back in the room, with just $50 in my pocket. While I try not bring too much money to Atlantic City, every gambler knows that going down with just $50 means you’ll lose it immediately. So, I’m ranting to my ladyfriend about how I want to take out $400. She says that’s probably a bad idea, and convinces me that maybe I should just take out $200. I agree with her, then immediately fall asleep. 9:00 – I wake up, very fortunate I didn’t take out any more money. Thank goodness for ladyfriend! That girl is alright! If it wasn’t for her, I’d easily be $400 lighter. I grab my favorite hangover cure, the pretzels at Bally’s, and we peruse the Boardwalk, getting some desperately needed fresh air. We aim for an 11:00AM bus, but when that line looks too long, we decide not to risk it and get a ride back with OB and the good Lady OB. Overall, these last two trips, when taken individually, were not enough AC for me, but together, they form a magical summer memory of Atlantic City. We’ve lost some good friends in Atlantic City this summer: the Revel, the Showboat, my memories from 10:00PM to 2:00AM on August 2nd, my $90, etc. However, new friends have replaced them: the Wild Wild West’s table games, Kirby, the Cape May Brewery, and slime. Enjoy the rest of the summer folks, and I’ll see you in the fall!